L attended Robin’s parent evening, where the news was entirely positive, if tinged with regret about his eleven plus result. A computer print-out showed he exceeded some benchmark across the full range of maths and English measures. Another showed that his reading age had climbed two years in the three months to December and another two years since then, giving him a reading age of 16. Gabe rarely leaves the house except for school and sporting engagements – playing or spectating. He has, though, been to a couple of parties recently and at those has drunk some alcohol. He’s not concealed the fact, nor dwelt on it, or thankfully, appeared to be any the worse for wear for it. I suspect he’s not liked it particularly, given how resistant he is to consuming any new flavours. He did ask me ahead of the most recent party, if I could give him a bottle of something to take. Cider was his preference and so, for the first time, I bought my son a drink – not one that we shared together though. At the first mention of drinking, a couple of months ago, I had said to him that if he wanted to try beer, he should ask me. Before I had finished this attempt at responsible parenting, I realised how unappealing drinking with one’s Dad would be – the whole point was to take these early steps in the company of friends. Eliza’s solution to a day at home without any major plans is to bake. By choice, she would always bake something sweet: cookies, cakes, millionaire shortbread. Today, with everyone else but me out at a Man City game, she decided to make pizza. We walked to the shops to buy the mozzarella and passata. She served the pizzas sequentially: L, Robin, Gabe, with her own coming last. By the time she reached her own, she had run out of mozzarella and sent me back to the shops to replenish. Eliza chose her birthday party to be an afternoon, evening, night and morning with her two best friends. They visited a craft cafe to make pots, ate ice cream and then back at home, watched tv and two videos, before the serious stuff of chatting in bed took hold. A word from L at 12.30am and they quietened down and slept until.. 7am when they soon had energy for indoor kickstone and spying on the rest of us. Gabe was invited to a sleep-over at his friend’s house the same night. The day before he mentioned that they would be playing Call of Duty, an 18 rated game. Not so fast, I said. Gabe was upset when L and I set our terms. he said there would be nothing for him to do there if he wasn’t allowed to play. The next day I called his host’s mother and said that he wasn’t allowed to play the game. She consulted with her son and called back saying, a little archly, they would find something ‘within the rules’. He wasn’t effusive about the sleepover the next day. We seem to have found a fracture with some of our peers over their willingness (and our refusal) to let pre-teen children play violent video games. I wonder if Gabe mentioned to me the plan because of his discomfort with it. Robin followed L into the loo and said it smelt of her. By which he meant it smelled of washing. Explaining more, he said I smell of rice – as I always make it; Eliza smells of ‘in my pockets’ – as she’s always playing with them; and Gabe smells of sweat – as he’s always playing football. We took Gabe and eight friends to an indoor go-kart circuit in the basement of a soon-to-be demolished factory for his birthday party. The karts, available to anyone over the age of eight, were the same as the ones adults with driving licenses and road sense use. L and I found ourselves the responsible adults without the ability to control the boys’ behaviour behind the wheel. Only one lad had a head-on crash with a barrier – the most reckless of the group – and only one opted throughout for caution. They were really quite adept, so perhaps the transfer of wii and x-box skills was taking place. Gabe started cautiously, but built up speed, ending up with the third fastest average lap time, with which he was very satisfied. The following day, City played QPR seeking a win for the Premiership title, with United poised to take advantage of any slip-up. Gabe watched the match on my iPad while he, Eliza and I played monopoly. In the opening 20 minutes of the second-half things began to go awry for City as they surrendered the lead and then fell behind. Gabe switched off the iPad unable to watch. We continued to play our game, but he was subdued. I was monitoring the game on my phone and let him know that City had equalised, but he didn’t want to watch. When my phone refreshed City had won and Gabe switched the iPad back on and wallowed in the celebrations. During his team’s historic half-hour, he had passed Go a few times, spent some time in jail, paid some fines and erected a few houses. Walking to school, Robin complained of a sore head. I suggested a cup of water when we got to school. Leaving the junior school with him, I noticed a lump on his forehead and realised he’d banged himself. “How?” I asked. “Don’t want to say. It’s embarrassing.” Entering his playground, the lump more visible, I got him to explain. Out of my eyesight, he had walked, head down, into a wheelie bin on the pavement. Reluctantly, he followed me to the school office to get some first aid. Ice applied, the teacher asked how it had happened. “Robin will have to tell you”, I said, as I signed the accident form. It’s test week at junior school. Gabe and his peers are doing Key Stage 2 SATs. In Eliza’s class, they are doing their annual assessment tests. A morning of tests and afternoon of play suits her well. Unusually, not a single complaint about having to go to school this week. One afternoon was spent at chess club. Back at home, we played our first match. She caught me out with an audacious queen move, but I recovered and eventually wore her down with risk-averse attack. Saturday afternoon was an exemplar of the privilege and opportunity that can come with being a child in our comfortable corner of north-west England. Robin went with his under-six football team to the Liverpool FC academy. For two hours, the boys played on a large indoor pitch, while outside sleet and dark descended. The academy coaches ran skills sessions, before organising a series of matches within the squad. All the time, experienced eyes were assessing the merits of the five and six year olds. Several parents were taken away from the pitch to another type of pitch: to get their talented sons to join the Liverpool academy. Gabe was part of a group of schoolmates taking part in a friend’s birthday treat in Oldham. The boys went to a converted industrial building to play laser tag. They were equipped with guns that fired light beams and let loose in an indoor battle-field with obstacles, fox holes, rubble and a graveyard. Shots were rationed and hits recorded as the boys waged hi-tech warfare in teams to eliminate or capture their opponents. Eliza took part in a concert in a large and local church hall, organised by her piano teacher. Eliza played first in a rookie string quartet, attracting comment from the audience for being by far the smallest member. Then after an interval, she distinguished herself for courage, as well as musicality, playing a solo piece on the piano. Robin marked his sixth birthday by losing his first tooth. It fell out in the day, letting him avoid having to negotiate his birthday pizza with a very wobbly tooth. His party was in the leisure centre and involved games of football and play on a bouncy castle. Gabe can seem mature for his age: chatting to dads at Robin’s football about City and United. And he can seem naive: not really up to speed with his friends in the car on the way to football practice, as they talk about asking girls out, wrestling and taunting each other. Eliza didn’t make it into the school choir. But she always has a song on the go, which gets sung repeatedly. Right now, we hear the first three lines of Ain’t no mountain high enough over and over again. Gabe turned ten today. 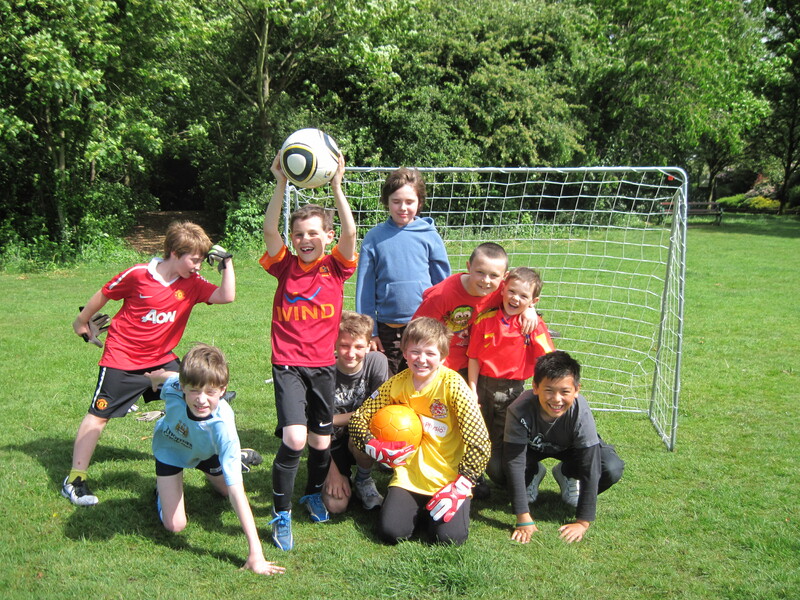 The party, of his own devising, involved a pairs football tournament in the park with seven friends and then a pizza-based lunch at home. The tournament was mostly played in good spirits, but the disappointment of defeat was too much for a couple of friends. Gabe was delighted with the party and presents, which were mostly £10 notes. Around him, a changing cast of L, Robin, Eliza, an older friend and I continued to play football in the garden, using his new metal framed goal, for the rest of the afternoon and early evening. All was well until bedtime. His old fear of not sleeping had resurfaced the previous night and kept him up and distraught until midnight. Once here, it takes some banishing and so his birthday evening, after such a happy day, has been spent in torment as time passes and sleep passes him by. Gabe spent the morning of the day before his birthday at a local secondary school with several hundred other children of mostly middle-class parents. The occasion was a mock 11 plus exam – four months before the real things. He managed to complete one of the time-pressured papers despite taking a toilet break in the middle. One of Robin’s youngest child grievances is that the other two have better beds. That may change soon. A few nights ago, after sitting on his bed reading a story and finding the bed a little saggy, I knelt down and leant on it to say “goodnight”. The bed collapsed. Robin denied jumping on it, but my suspicions remain. For the moment, he sleeps on his mattresses on the floor beside his bed, which looks like the exposed skeleton of a large, dead mammal with its flesh picked off. Eliza has been invested into brownies. The ceremony featured some concocted ritual: repetition of rhymes, stepping over a mirror and jumping over a toadstool. Only then did she go to Brown Owl and make her pledge. Gabe’s class does a weekly times table minute test. Gabe was disappointed before Christmas when he wasn’t the first in the class to get the full 45 marks, but he did manage it the week after. With a statistician’s touch, Gabe keeps a bar chart of his performance and calculates his average score. L is painting the walls of Robin’s room. While the work is progressing, he has moved in with Gabe for the first two nights and Eliza the third. There was some spiteful competition between Gabe and Eliza for the honour of hosting him – more evidence of his popularity. L didn’t buy Robin’s preferred shade of blue paint. This has enraged him and he complains loudly and regularly that the walls are too light. Eliza went to a roller-skating party, fulfilling one of her ambitions. She needed L to support her for her first circuit of the hall, but skated independently thereafter. Her pocket money (£1.50) will be put towards buying a pair of roller-blades which cater for feet 1/2 size larger than hers – but still the smallest manufactured.